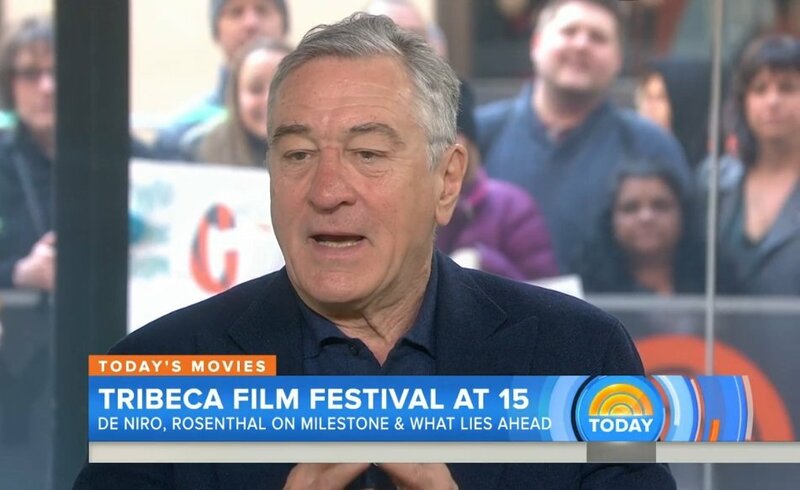 Academy Award winning actor Robert De Niro appeared on the Today Show to discuss the beginning of the Tribeca Film Festival. De Niro appeared with Tribeca co-founder Jane Rosenthal. De Niro defended his original decision to include the film "Vaxxed" in the film festival, which was later reversed, and encouraged everyone to see the film, as well as another film called "Trace Amounts." He expressed regret at having to exclude the film, but stated he did not want the Festival affected by the controversy. Jane Rosthenthal, the co-founder of the Tribeca Film Festival, then made the shocking statement that the film was pulled from the film festival not because of pressure from sponsors, but because other film-makers threatened to pull out of the festival: "There weren't sponsors or donors that were threatening to pull out of the film festival, but these were film makers, and we're known for having amazing documentary films... It was our film makers that were pulling out." De Niro replied: "I find that amazing, and we're going to talk about that." In defense of the film industry and freedom of speech, De Niro went on to state: "All I wanted, was for the movie to be seen. People can make their own judgement, but you must see it." Well, Robert--you've enjoyed a long career being lionized by the media left as an elite Hollywood actor. Now you're finding out what it's like to cross them. Welcome to reality. I can think of better people to piss off....Or worse as the case may be!